Sheriff Mullendore was first employed as a police officer with the Town of Boonsboro in 1974 and worked there until 1978. He was hired by the Sheriff’s Office on January 18, 1982 and completed the Western Maryland Police Academy that same year. In 1983, Mullendore received the Maryland Sheriff’s Association “Deputy of the Year” for the capture of two suspects, while off duty, who had broken into numerous vehicles and garages in the Boonsboro area. He was promoted to Corporal in 1984. On October 6, 1986, the Washington County Narcotics Task Force was created, and Mullendore was appointed as the first Director, and was promoted to Sergeant in 1988. After being promoted to Sergeant, he was assigned as the Administrative Sergeant at the Sheriff’s Office in 1990. Mullendore completed the FBI National Academy in 1994 and was subsequently promoted to First Sergeant, as the Assistant Patrol Commander, in 1994. 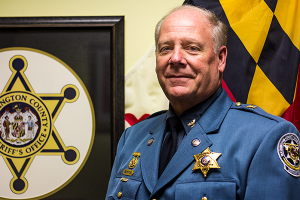 For the second time in his career, Captain Mullendore was awarded the Maryland Sheriff’s Association “Deputy of the Year” in 1996 for Distinguished Service. In 1998 Mullendore was promoted to Lieutenant and assigned as the Patrol Commander. On November 1, 2001, Mullendore was promoted to Colonel, which is the Chief Deputy. He completed his course of studies and received his Bachelor’s Degree through the University of Phoenix in 2004. Mullendore also completed the FBI Greater Chesapeake Law Enforcement Executive Development School in 2005. He also attended the Maryland Police Correctional Training Commission’s Leadership Challenge School in June 2005. In November of 2006, Colonel Mullendore was elected Sheriff of Washington County. The Sheriff has obtained his credentials as a Search Manager for missing persons through the Maryland State Police and the National Center for Missing and Exploited Children. He has since had the agency certified under the National Center for Missing and Exploited Children as the only agency in the State of Maryland under the Readiness Project. Sheriff Mullendore is also a member of the Western Maryland Incident Management Team. Colonel Randy Wilkinson, a life-long resident of Washington County and a 1971 graduate of Boonsboro High School, was hired as a police officer for the Town of Boonsboro on November 17, 1974. He graduated from the Western MD Police Academy in August 1975, while attending Hagerstown Junior College. Wilkinson was employed as a police officer for Boonsboro for over 5 1/2 years, where he attained the rank of Sergeant/Officer in Charge before moving onto the Washington County Sheriff’s Office. On August 2, 1980, Wilkinson was hired as a Deputy Sheriff by Sheriff Glenn Bowman. He served as a Patrol Deputy, assigned to a “Traffic Safety Unit”, before being promoted to the rank of Corporal in February of 1982. A little more than 5 years later Wilkinson was then promoted to Sergeant on July 1, 1987, serving as a Shift Commander. In the summer of 1988 Sgt. Wilkinson transferred to the Criminal Investigations Unit, where he served as the Criminal Unit Supervisor for the next ten years. In 1989 Wilkinson received the Maryland Sheriffs Association’s “Deputy of the Year Award for Valor” and was also nominated for an award by the Andrew Carnegie Foundation after being credited for saving the life of a 19 year old unconscious female by pulling her to safety before her vehicle exploded into flames while he was off-duty. On December 5th, 1998 Wilkinson moved back into uniform after receiving another promotion to the rank of 1st Sgt., where he served as Assistant Patrol Commander. Less than three years later, in November of 2001 he was promoted by Sheriff Charles Mades to the rank of Major, in charge of the Patrol Division. After Sheriff Mades retirement, Wilkinson was appointed to the Chief Deputy’s position in January of 2007 and given the rank of Colonel by Sheriff Douglas Mullendore. Colonel Wilkinson has attended many supervisory, administrative, and management courses throughout his career, including the Greater Chesapeake Law Enforcement Executive Development School sponsored by the FBI and he is also a graduate of Leadership Washington County. 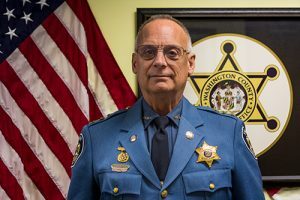 Colonel Wilkinson currently serves on the Board of Directors of the Maryland Sheriff’s Association.